To install a ClearZone snow melting system in concrete, the driveway is first prepared for the concrete pour, including the placement of rebar or remesh. The durable heat cable is then secured to the wire remesh or rebar with zip ties and then the concrete is poured. Concrete seats or “Mesh-Ups” are often used with wire remesh to ensure proper positioning of the cable. In addition to the heavy stress of fresh concrete pours, ClearZone cable is also designed to withstand the extreme temperatures of hot asphalt applications. The cable is laid out and then the asphalt is applied on top and then compacted, resulting in a discreet, maintenance free asphalt heated driveway. You can lay out the mats or space the cable yourself, but it’s important that a qualified electrician connect the wiring for the snow melting system. To heat an existing asphalt driveway, the process is surprisingly simple. The cable is laid on top of the old asphalt and then the new layer of asphalt is applied on top and then compacted. Retrofitting a concrete driveway with radiant heat is a more tedious affair. 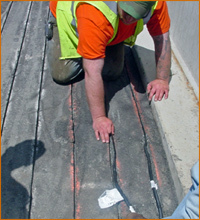 Grooves are cut in the existing concrete, using concrete saw-cut technology, and the heat cable is then placed in the freshly cut grooves. An epoxy topcoat is then applied over the newly embedded cable sealed to seal the heating cable. A sand broadcast can be applied to the surface before the epoxy cures for additional traction and safety. Saw cut technology can also be used for retrofitting asphalt driveways if desired. There are several options when it comes to installing a radiant snow melting system. For example, you can heat the entire area of a driveway, or perhaps just an 8-foot strip in the middle or just a pair of 2-foot-wide tire tracks. Radiant heated driveways and snowmelt systems can be tailor made for virtually any of your snow and ice melting needs. The applications are limited only by your imagination, and the experts at Warmzone will work closely with you to determine the best system for your needs. Eliminate the need for the use of harsh snow melting chemicals and prolong the life of your driveway with an environmentally friendly radiant snow melting system. Not only can installing a radiant snow melting system increase the value of your home, but it will also increase pedestrian safety. So enhance your safety and peace of mind by calling Warmzone and learning about the options of installing an automated snow melting system today.